Take your chicken breasts and slice them as thinly as you possibly can. If you can't slice them thin enough by hand or if your knife is not sharp enough, then just slice them as thin as they'll go and then pound them to 1/4 inch thickness or less. I got 4-5 thin slices out of each breast. Lay your chicken pieces out and top each slice with several whole fresh sage leaves. 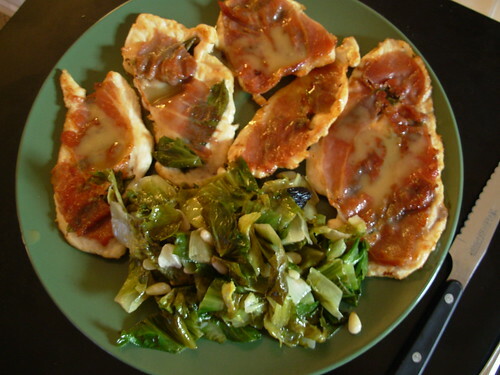 Place a slice of prosciutto on top of each piece of chicken and pat it down so it adheres to the chicken. Heat olive oil in a cast iron skillet over medium high heat. You want the pan pretty hot so that it will brown the meat without overcooking it (since it's so thin). Cook the chicken in batches, starting prosciutto side UP first. This will let the chicken contract a little without the prosciutto shrinking. Flip the chicken and let the prosciutto side cook until it looks crispy. Remove to a plate and finish up the rest of the chicken in the same manner, adding more olive oil to the pan if necessary. Once all the chicken is done, add the white wine and chicken broth to the pan and deglaze by scraping the bottom of the pan with a wooden spoon. Once the liquid has reduced a little, stir in the arrowroot/cold water slurry and stir quickly to thicken. Serve the sauce over the chicken. Heat a glug of oil over medium heat and add the whole garlic cloves. Once the garlic starts sizzling, add the escarole, raisins, pine nuts, salt, and liquid. Cover the pan, reduce the heat, and braise for 10 minutes. Remove the cover and let the liquid cook off. This results in plump raisins, but the pine nuts get kind of plump and soft too. If that's not to your taste, you can leave the pine nuts out and toast them in a skillet or toaster oven and then add them to the dish at the last minute. This looks so good, please ship all leftovers (or a new batch) to me :) I love your recipes, I'll keep watching and maybe I can try this one out too! Oh ... wow ... just wow. That looks so unbelievably delicious! Now that look unbelievably delicious! I'm going to the store tonight to get the ingredients. Oh my gosh! i'm so excited I found your blog today! beautiful georgeous paleo recipies! Thank you for sharing your creativity! WOW, we tried this tonight and it was delicious -- loved it so much I left the table and had to come straight to the computer to thank you. Kale and sage are in my garden now, so I had kale instead of escarole, and with pumpkin seeds added after braising: it still worked well but I'd love to try it next time with escarole, I imagine those flavors perfectly complement the dish. I love your photos and recipes: this is my favorite paleo recipe blog, by far. Please keep posting often, I love how you cook!